”We can’t keep being abandoned," said a resident who lost her mother after Maria and is now caring for her cancer-stricken father. In the months after Hurricane Maria hit last year, 10 towns in Puerto Rico had more deaths than they had had in the same period the previous two years. What else do the towns have in common? They're high poverty areas. The government of Puerto Rico on Tuesday released much-anticipated documents about post-Hurricane Maria deaths, following public pressure and several lawsuits. The information is still preliminary and excess deaths have not yet been reported across all 78 municipalities in Puerto Rico. Of the 10 towns, Cabo Rojo showed the biggest increase. According to the Demographic Registry, the town reported 106 more deaths in the months after the hurricane than in the same period in 2015 and in 2016. Half of Cabo Rojo's population lives in poverty, according to the Census Bureau. The situation in Cabo Rojo mirrors the reality in much of the island, where large percentages of the population live on incomes well below federal poverty lines and where higher rates of chronic health conditions and disabilities have made living in precarious post-hurricane conditions more challenging. 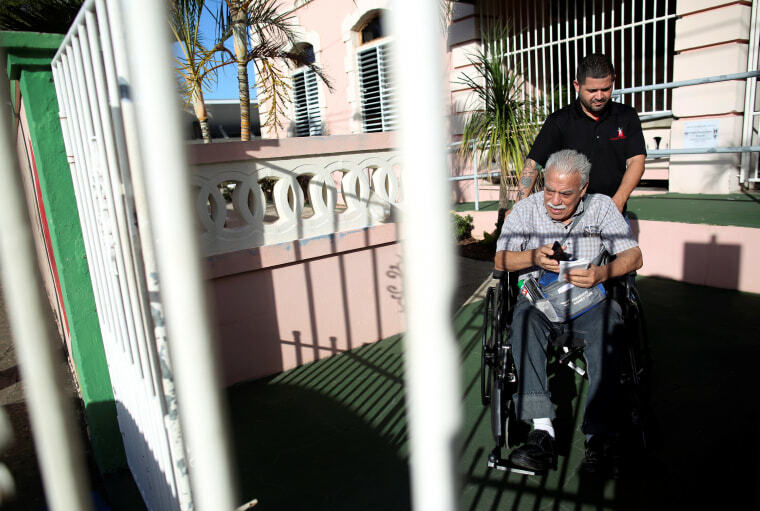 It has been especially difficult for many islanders over 65, who make up about 20 percent of Puerto Rico's population. One of those places is the town of Yabucoa, where Hurricane Maria first made landfall and where the poverty rate is about 50 percent. Lenis Rodríguez, a community leader, said many of the town's residents have diabetes, respiratory conditions or cancer. As of Wednesday, roughly four neighborhoods in his town were still without power, he said. This has put a toll on those in frail health. “With so little access to power, many lives are at risk,” Rodriguez told NBC. Yabucoa Mayor Rafael Surillo has said that he feels his municipality has been discriminated against compared to metropolitan areas because it's less affluent. "If the hurricane had entered through San Juan or Guaynabo, I would not have had to wait three months for a light post," he said. Access to resources and medical services was a problem in Puerto Rico even before Maria. According to a 2016 report from the Puerto Rico Department of Health, 72 out of the island’s 78 municipalities were deemed as medically underserved areas — meaning that they face “unmet health care needs.” The need became more dire in the months after the hurricane as the island lacked power, water, medication and other resources. Overall, the Demographic Registry saw a 14 percent increase in deaths between September and December 2017 — 1,397 more deaths than the previous year. A study from Harvard University estimates that the hurricane death toll could surpass 4,000. Julio Santos, a church minister in Yabucoa, told NBC News that an elderly resident from the community of Barrio Ingenio, Heriberto Rivera, died Monday despite community efforts to get him supplies such as a generator and medication. Don Heriberto, as he was called, was recovering from a stroke when the hurricane hit; his condition deteriorated after a lamp post crashed next to his home and he became anxious and panicked. River, who was bedridden, was in need of respiratory therapy and other treatments, which were in short supply. “I remember the first time I met Don Heriberto. I went to pray with him. He couldn’t open his eyes before, but when he heard the prayers — he opened his eyes,” recalled Santos, who has been helping other bedridden elderly residents of Barrio Ingenio. Other residents have similar stories. Eva Velázquez's mother, Blanca Velázquez, was an Alzheimer's patient who suffered additional health complications after the hurricane. “It wasn’t easy and not having power made it very difficult,” said Velázquez. Barrio Ingenio had its power restored on Friday, nine months after the hurricane, but Velázquez is concerned the connection is not reliable enough to treat her father. “The power has gone out multiple times since they restored it on Friday. I mean, right now I don’t have power,” Velázquez said.